JANUARY FLYER INCLUDES FREE WIDE TABLE SAWT4, if purchasing online, we will provide a full refund for your table once order is processed. 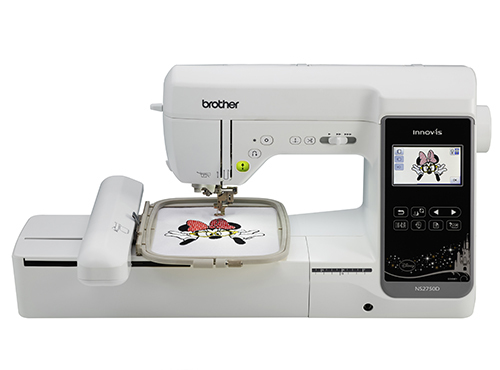 Introducing your next best friend, Brother's sleek powerhouse: NS2750D combination sewing and embroidery machine. This elegant machine boasts a 5" x 7" embroidery area with embroidery speeds up to 650 stitches per minute. Not only are there 138 built-in embroidery designs, but only Brother can bring a touch of Disney magic into your creative life with 35 of these being exclusive Disney embroidery designs. Compact yet packed with amazing features like automatic thread tension, thread cutter, USB port, side feeding and so much more,the NS2750D is portable perfection in every way. Built-in stitches, buttonhole styles, fonts and super speed: 240 built-in stitches, 10 styles of one-step auto-size buttonholes and 5 lettering fonts with a maximum sewing speed of 850 spm. Embroidery designs and maximum speed: 138 built-in embroidery designs - including 35 Disney designs - with a maximum embroidery speed of 650 spm. Large embroidery area: Maximum embroidery field of 5" x 7". Includes one 5" x 7" embroidery hoop and a 5" x 12" multi-position hoop! 7.4" from needle to arm: your 7.4" x 4.1" work area means you have the perfect amount of space to easily maneuver your fabric. 3.2" easy-view colour LCD touch screen display: use the brightly lit, touch screen LCD display to easily manage all your sewing and embroidery functions. Automatic thread tension: automatically adjust your thread tension to the stitch selection. Thread cutter: put those scissors away and save time with the convenient automatic thread cutter. Sideway Sewing: use sideway sewing to help maneuver your large projects with ease. Knee lifter included! Enjoy the "hands-free" way to control your fabric as you sew. Maximum Embroidery Area (X x Y) 5" x 7"
Machine Dimensions (H x W x D) 17.6"x 9.5" x 11.8"
Brother SAWT4 Wide Extension Table 11" x 19"